News from David Price at Hill Robinson that the 57.3m motor yacht Diamond A has now arrived in Sint Maarten and is available for Caribbean charters in a superyacht that defines gracious living afloat. Built by Abeking & Rasmussen in 1998 and previously known as Ultima III, she has entertained many happy guests with very successful charters and is now ready for the new winter season. Diamond A has eight cabins comprising six double and two twin staterooms in which she can welcome up to 12 guests. Guests can enjoy lounging on the spacious decks on the comfortable sunbeds, relaxing in the Jacuzzi or simply drinking in the views from her Portuguese deck. Inside, the Donald Starkey design emphasises her extraordinary volume and Captain Owen Jones and his crew will make sure all guests experience Diamond A to the fullest extent. 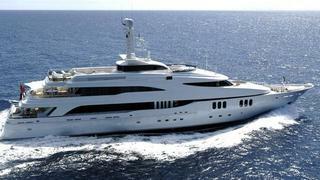 Charter rates start at $349,000 per week.